My Journey to Birmingham; 50 days and counting! 50 days out and we are heading to Canberra, with our grandson, James, 5, for some fun. It is a tradition, we started 13 years ago, we take the child, who has started school, that year, to Canberra for four days. Watch this space for what we get up to! The last 12 days have been a mixed bag. Unexpected visits to our GP. Me with suspected DVT, it wasn't and for my flu shot. Paul with an ear infection. One specialist visit is done, one to go. We have had our youngest turn 40! We celebrated with a family lunch and then we had both children, for a couple of nights. All the meals are done! All up I did nine different meals and most made five servings. All packed into the freezers. I've also booked theater tickets, for the West End. I'm seeing Mousetrap and Aladin. Lunches and coffee with friends have rounded out the days. 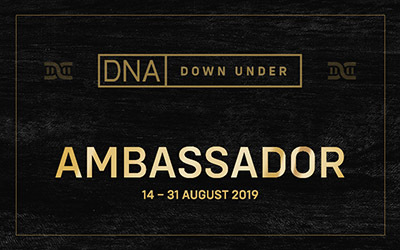 DNA Downunder. Have You Seen This? www.dnadownunder.com This web address is the portal to a DNA Adventure, especially in Sydney! There are earlybird specials, for those who book before 30 April. Three days for $275, after 30 April it goes up to $335. It's a no-brainer, $60 to spend on goodies! For those doing the full three days, or coming from interstate, why not look at staying nearby? Jennie Fairs and I are doing this. It will give you so much extra time, with likeminded people, to have dinner and continue the discussions. You can also DNA TO THE MAX and do two cities! You get four days, 10+ speaker, 50 topics. Do Canberra and Sydney; Brisbane and Sydney; Melbourne and Sydney; Adelaide and Sydney. For the really dedicated Perth and Sydney and then after, spend time exploring Sydney and the surrounds! So will I see you in Sydney? Hope so. My Journey to Birmingham, Pre-prep. I suppose this post should have been the first one but I realise that some of you might not know what it takes to organise a trip to Birmingham. First I can't just get in my car and drive as I am in Australia, some 17,030km, (or 10,582miles) away. Air travel is required and this involves a stop-over, somewhere. So on Tuesday 4 June 2019, I'll leave my home at aroun 11.00am, so I can take a train to the airport, around a 20min fast train trip. Then at 15.55, (3.55pm) my filght leaves, for Singapore, according to my ticket a journey of some 3,907 miles, taking 8hs20mins, arriving 22.15, (10.15pm) Singapore time. Singapore is 2 hours behind Sydney. At 23.55, (11.55pm) Singapore time, the next leg starts, to London, 13hrs 30mins away, according to my ticket, 6,764 miles. We arrive bright and early at 6.25am, London time, Wednesday 4 June. Some 25hrs, since I left home! My Journey to Birmingham. 62 days and counting! Tuesday 4 June I fly to England to attend The Genealogy Show and am now starting to feel that I haven't got enough days left to do all that I need to. So, what, you are thinking, just pack your suitecase and go! Well it isn't that simple because life is still happening and it is ONLY 62 days away! I've been cooking meals for Paul, as he is blind and can't see to cook. Yep, 42 meals have to be done. 30 down 12 to go. Feeling good about that. Two speciatist appointments, one ultrasound and three blood tests haved to be done. Two short trips are also in that mix. Bills have to be paid, that are due while I'm away. Outlines for the Writing Discussion Group have to be done and submitted. You know what, the above will be sorted out, I will leave on the day, life will still happen and I'm going to England! I'm going to do odd blogs about getting to the 62nd day, so watch this space. 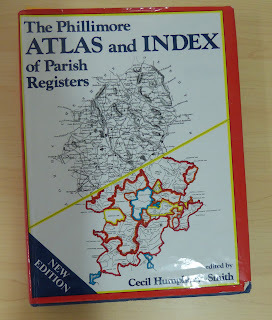 Books I Use, April 2019, The Phillimore Atlas and Index of Parish Registers. This was an indulgence, of mine, when I saw this secondhand copy, of the second edition, published in 1995. It is, as it says an atlas of Parish Registers, for England, Wales and Scotland. Wonderful for finding, exactly where my ancestor's parish is situated and what the neighbouring ones are, has lead looking just a bit further, on the chance that I might find them. Now up to the third edition and also avaliable as a PDF, but I'm not sure if it is the full book. It can also be searched on Ancestry and Trove has listings of which libraries, in Australia, have copies to use. To quote, " For each region, listed below, the Atlas contains (unless otherwise stated) a map of the pre-1832 parishes, and a topographical map from James Bell's A New and Comprenhensive Gazetteer of England and Wales of 1834." The Index, at the back lists all parishes and information about, deposited original registers, local marriage indexes, etc and the years that they cover. Today I'm going to share links to some of my fellow bloggers posts. I really enjoy reading others' posts and they range from a very new blogger to seasoned ones, so enjoy. https://www.legalgenealogist.com/ Judy G Russell, is a retired lawyer, hence the name of her blog but it is often anything but legal. The lastes post is about Private Laws and I suggest you have a read as I had no idea such things existed. Thirty-four years ago, I started this crazy, exciting, sometimes frustrating genealogy journey. This is part of that journey and one I am thrilled to have taken. During the 1980's I did meet the husband, Trevor, of one of the daughters, Patricia and two of their children, Kyle and Tess. I was then told that there were three other children, Maggie, Trevor Jnr and Alice, but they had been adopted out. I spent many hours searching for them but being in the 'present', had no luck. Women's History Month 2019. My Grandmother and Great-Grandmother. For Women’s' History Month, 2019 I pondered who I could celebrate? My maternal grandmother and great-grandmother are my choice. Isabella Mary Ann Vaughan was born 18 September 1847, to Henry Vaughan and Charlotte Chasmar and baptised on 3 October 1847, at St Philip's, Sydney. On 11 October 1866 Isabella married William Martin, at St Andrews Church, Sydney and the marriage is announced in three Sydney papers. William and Isabella have eight children between 1867 and 1879. Isabella is widowed, sometime after 1879. On 6 May 1883, at the Congregational Church, Glebe, Isabella re-married, to August Frederick Conrad Jasper. August and Isabella have four children, three of whom die. Eveline Maud Jasper was born on 3 April 1885 at Sydney Street, Macdonaldtown, to August and Isabella. On 30 December 1908, at St Stephen’s, Newtown, she marries Arthur Alfred Victor Galbraith. They have 10 children, five of whom are still living. Books I Use, March 2019 A New History of the Irish in Australia. This is my choice for this month a new book that was published in 2018. I found this book to be a very interesting read and it gave me a better perspective, as to what my Irish ancestors might have gone through. The book has two sections and a total of 10 chapters, with an introduction and an epilogue. Section One, covers Race and looks at the Irish and their interaction with both Indigenous Australians and the Chinese. It also looks a various immigation schemes. Section Two covers Stereotypes, looking a such things as employment, crime and politics. Elizabeth Malcom and Dianne Hall have written a clear and consice history, which is easy to read and explains the way things were. I purchased my copy from Gould Genealogy & History, www.gould.com.au for $34.95, plus postage. I would recommend this book for anyone with Irish ancestors. WOW! What an Interesting Course. Blogging Your Interest with Thang Ngo. Hosted at Writing NSW, at Callan Park. Thang took us through how we can set-up a blog. Finding our niche. 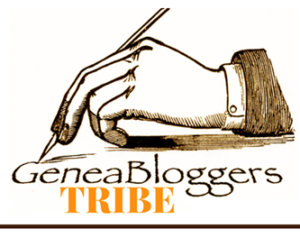 Looking a different blogging platforms and writing styles. Finding your voice and writing tips. Questions were encouraged and the discussions were useful and informative. Now you might wonder why someone with nearly nine years as a blogger and 600+ posts would attend? Well, why not? I'm a firm beleiver that you can always learn something new and that by attending classes, workshops and lectures is the way to go. I have learn't how to look at Google Trends, something I had heard about but not used. Also getting rid of those annoying words, like, like, very, almost, just, to mention a few. The Marriage That Never Was! I've been playing around on Ancestry and looking at different hints, on side branches to find connections etc. Well today I was looking for Jessie James, no not the outlaw but my great aunt. Jessie was born Jessie Elizabeth Grant on 18 Febuary 1868 at Ballarat, Victoria. In 1891, in Sydney she married Charles Frederick James and they had three children, Beatrice, 1893, Victoria May, 1896 and Frederick, 1898. It is the near marriage of Victoria May, that I found. It would appear that on 13 June 1916, John Laver, son of William Robert Laver(s)(dec) and Alice Miller(dec) and May Victoria James, were to be married. They were both listed as living at 44 Bucknell Street, Newtown. He was said to be 25 and May, 21. The image I have shows CANCELLED written right across both pages, with nothing else written, either on the certificate or in the margins. Just the details, required for the paperwork. Today is #GenealogySelfieDay and this is my second photo. Like Shelley Crawford said, 'If only I could participate in genealogy selfie day without actually posting a selfie.' I fully agree with this statement! The idea was to take a selfie and then write a blog. Here I am. I have been 'doing' my family tree for 34 years, last month and about two or three years into it, I met children of a half-sister. She was from dad's first marriage. It transpired that she had given several children up for adoption. The children I met wanted me to look for them and while I could have done so, I felt it better if they searched for the siblings. I heard nothing more. I don't know about you but sometimes I really wish my ancestors would give the FULL spelling of the child's name. Nicknames, abbrevations and names written in Latin are just some of the things that I have found. These two little books have been very useful. When we research our ancestors, we look at the certificates and see an address but what does it tell us? Sometimes useful information, sometimes, not. 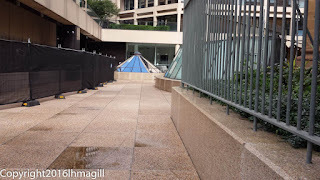 It doesn't tell us what the buiding was like, how many rooms, how much it was worth or who owned it. Interesting information, that would make that address more 'real' to us. With the advent of Google Street View, we can often see the street or house mentioned and this gives us something tangable, for our research but that is now, not back then. These past couple of weeks, I have been searching the City of Sydney, Rate Assessment Books and finding descriptions of some of the places my ancestors called home. My DNA Results and what they mean to me. Way back in October 2013, I took my first DNA test, with FamilyTree DNA and wasn't surprised by the results. In fact I was disappointed, until friends explained that it confirmed my paper trail. Nothing happened until RootsTech 2017 and a new testing company, LivingDNA, came on the scene. So in May 2017, I again scraped my cheek and sent it of for testing. Again I wasn't really that surprised with the results. February 2018, saw me take a test with MyHeritage, only to find that both FamilyTree DNA and MyHeritage use the same testing company. Something I wish I had known before I tested. My results weren't that different. Books I Use. January. Dictionaries. Welcome to a new series of posts, showcasing a selection of books, that I use, with my research. DISCLAIMER. These are my own recommendations. I'm not being paid to showcase them. I know that now days, most thngs can be 'Googled' and meanings found instantly but I'm old fashioned and like my dictionaries. The Oxford Concise Medical Dictionary is used every time I receive a death certificate and can't understand the cause of death. The Oxford Dictionary of Law. I find this invaluable, for deciphering those legal trems, found in will, deeds, etc. The Pocket Oxfor Latin Dictionary. Again used for wills, deeds, baptism certificates and other documents. My latin hasn't improved but I can now find the meaning easily. I hope I now have some sapientia*.